With 21 brief 3-5 minute videos on everything from decision making, to improving execution, change management issues and much more, you’ll turn to this library again and again to hone your management skills. As a manager, you're responsible for the quantity and quality of your team's work. How do you ensure that your team members work to the best of their ability, and that your team works well as a group? 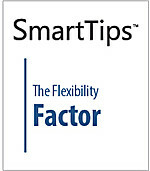 This SmartTips video helps you answer that question. Coaching skills can help provide a structure for conflict management, and can also provide a tool for developing creative conflict resolution. 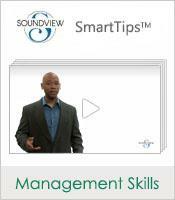 In this SmartTips video, we look at four key tips that can help you effectively coach employees through conflicts. Sometimes team members need to be nurtured individually to accomplish greatness. In this SmartTips video, you'll learn about coaching for performance. By providing the proper support, you too can coach your team to victory. 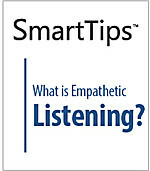 SmartTips: What Is Empathetic Listening? Get the most out of what you are hearing by understanding what the speaker is feeling. This SmartTips video defines different types of listening and gives specific steps on how to connect and become a more empathetic listener, the highest level of listening. Crises are unavoidable, but being prepared with a simple list of guidelines will help you get through them with confidence and right the ship. 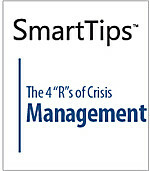 Look to this SmartTips video to guide you through the four steps of crisis management: Readiness, Response, Ride it out, and Reflection. Listen up! Active listening takes effort, but it is a valuable skill when interacting with anyone in the workplace. This SmartTips video describes the benefits of active listening as well as what it will take to become a better listener. The ability to be flexible is a characteristic that bosses count on and appreciate in their workforce. When changes must be made, it will be to your benefit if you can cooperate and adjust quickly. This SmartTips video looks at how to become more adaptable and develop flexibility. The important thing to realize about making a mistake is that you can learn from it. By accepting that mistakes can make you better at what you do, you will learn how to "fail forward." 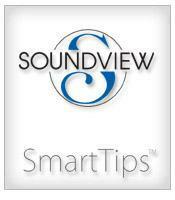 This SmartTips video takes the optimistic approach to evaluating mistakes and shows you how to get back on track.